It's been a tough last part of the year for Cool. In August, he started limping. We thought it was just tight muscles from sitting for long periods of time. A week went by and we noticed that in addition to the limping, Cool's right heel was lower than his left heel and he was having trouble walking, sitting and getting up. We could sense he was in discomfort, possibly even pain. We called Cool's vet and they had us bring him right away. The vet examined him but couldn't find anything wrong at the time and sent us home with some anti-inflammatory and pain medication. After two weeks of the treatment with no results, we took Cool back to the vet. By now his heel (also called the hock) had dropped even more. At this vet visit they took several x-rays of Cool's spine, hips and legs. We had done some research and we were terrified that his symptoms matched what we thought to be degenerative mylopathy; a condition of older dogs where they lose all function of their legs, leading to paralysis. Luckily, the x-rays didn't show any signs of this disease. However, there were sings of bone loss, and the telling sign of his symptoms. The vet pointed to the achilles tendon area and explained how it appeared ruptured. She advised us that the situation was serious and that we needed to see a specialist as soon as possible. There were two possibilities of treatment depending on the specialist's examination; either a splint to help the tendon heal or worse case scenario, surgery. So we took Cool to the specialist the first appointment we could get. After the specialist read the x-ray, he confirmed that the tendon had ruptured but also had become dislodged from the bone. With this news, surgery was the only option. Cool underwent the surgery in late September. 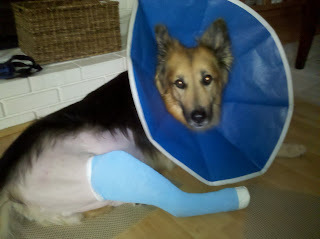 The estimated recovery time was eight weeks with weekly visits to have his cast and bandage changed. Cool was mobile and was doing well. Eight weeks went by and were anxiously awaiting to hear that he was healed. It was the week before Thanksgiving when Cool's cast was supposed to be permanently removed. Unfortunately, that was not the case. Cool was not yet recovered, in fact, four more weeks of a soft cast was recommended. Even though the surgery was successful, older dogs like Cool (14 yrs old) sometimes take longer to heal. We knew going into the surgery that there was no guarantee. But we needed to do what we could to help our dog. This past week we learned that Cool is still not recovered and that he will need to wear a splint for the rest of his life to support his leg. Luckily, Cool is in good spirits. He's our same happy dog who can still walk and we're so thankful to have him in our life.